This day featured a slight risk for severe storms across northern/central North Dakota. Awaking in Bismarck, we shifted north to Minot for lunch and a weather ballon launch. As expected, all ingredients were in play for tornadic supercells except moisture. 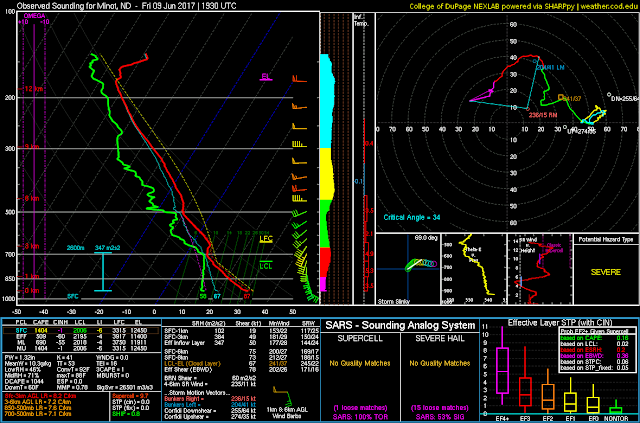 Our sounding revealed large dewpoint depressions leading to relatively high LCLs (~700 mb). NOTE: It's likely that the LCLs were actually much lower than this, especially just along/north of a WNW to ESE oriented boundary from KMOT toward Rugby, ND. This agreed with what we were seeing visually with a developing supercell just east of Minot as bases were much lower than expected. Awaiting at a gas station in Towner, we moved slightly west for a better view of this maturing supercell. It had some nice classic structure and we even witnessed a brief tornado just after a RFD surge. However, deeply mixed convection also fired to the south and sent a cold pool northward toward our storm. By this time, though, our storm was already throwing up all over itself as the cold downdraft began to overtake the cell causing parcels to convect up and over the cold pool. The northward moving cold pool proved to be the nail in the coffin for our storm, even though it did try to recycle west of Devil's Lake. We need to examine more ways to forecast thermodynamic and kinematic structures of the downdraft relative to the environmental buoyancy profile. Oh yeah, and moisture is important!